The air around Kotzebue, Alaska was filled with static electricity. The excitement was palpable in the community and had been for weeks. Today was a day that would go down in the history books. Every person in town was figuring out how to get a glimpse of the President or even how to shake his hand. The school gymnasium was full with people anticipating his arrival. While waiting, background music was playing, and whenever a pause in music was heard people would hold their breaths not wanting to miss a moment of his arrival. Some people would stand eager to show their respect upon arrival. After numerous false signals, a wave of laughter spread throughout the gym as people sat down again in waiting. At last, the President made his entrance to the gym which exploded in deafening cheers and support. After a few minutes the President jokingly told us we could relax because he was going to be there for a while. It was obvious within the first few words he said why this man was the leader of the United States of America. His charisma and genuine down the earth nature connected with every person in the room regardless of age, gender, or political views. He understood us as people, valued and respected our way of life, and more importantly cared for the future of our region. The speech itself had many surprises including the fact that the President mentioned the success diesel wind hybrid systems for remote island grid communities and that the United States would now help Alaska to take a leading role in creating community resilience in the face of climate change. When the speech wrapped up, the President took as much time as needed to greet and shake the hands of the every one of the Teck John Baker Youth Leaders in the room. Eventually, the crowd began to disperse in hopes of getting out to Front Street to see the motorcade drive by on its way to the airport. Our plan was to drive to our dog yard because we were at the end of Front Street and could see him from there. On our way out, John got two phone calls. One from Secret Service and one from the White House staff: the President wanted to visit with us at the kennel. Over the next two hours we watched in amazement as the Secret Service thoroughly went through the yard for any hazards. All of us at the yard also were given a body sweep with the metal detector and our names were submitted for background checks. It was shocking how truly easy going the White House staff are. Just real people, with real families, and a true enjoyment of our land and people. It was a pleasure getting to know them. I enjoyed talking to the Secret Service about just how formidable they would be if they all drank Bulletproof Coffee in the morning! While waiting the puppies got plenty of attention as almost every person coming into the yard, no matter how tough, had to see them. The entire motorcade, at least eight vehicles, drove into the dog yard. A door was opened and out walked President Barak Obama, with his signature smile, immediately greeting the extended family of friends at the Team Baker Kennel. The President then walked over to meet John Baker and Katherine Keith. John gave the President a Team Baker jacket along with an Iditarod Champion baseball cap. Katherine got to hold the President’s coat for him in the meantime. Team Baker now has a new team member! Our daughter’s Amelia and Tahayla each held two month old puppies: their names are Feather and Moose. The President was drawn right away to the puppies and took Feather to hold himself. Puppies are quite hard to resist after all. 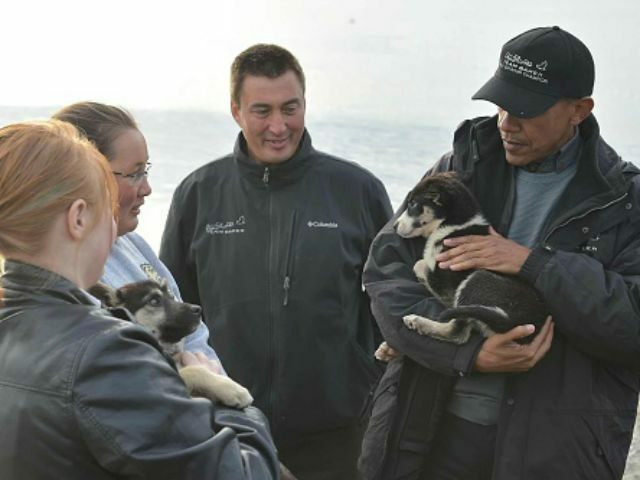 President Obama was asking questions about the puppies, dog training, and the Iditarod race in general. John had his sled out for him to see and the President stood on the runners to try it out for himself. 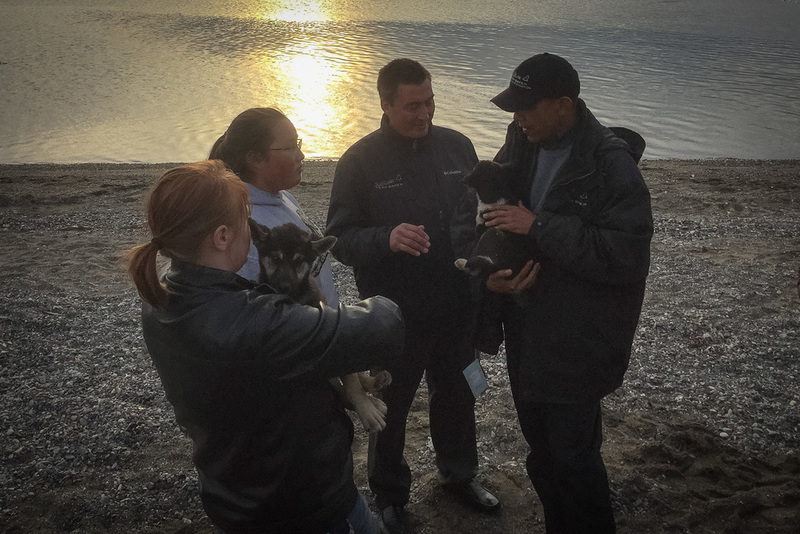 I have no doubt the President and his family will be tuned into www.Iditarod.com this coming March looking out for Feather! John took the opportunity to thank the President for his time in our region and how much pride that gave to the residents here. Bringing attention to our challenges will help us to find resources to discover and implement solutions which have currently been eluding us. Our villages need support now more than ever and the President’s remarks about everyone coming together as a team to achieve a common goal was very timely. The President thanked John for standing up as a leader for rural Alaska and for young people everywhere. Katherine expressed her gratitude in the strong measures the White House is now taking toward supporting rural energy efficiency, renewable energy, and climate change which had been her area of work for over a decade. The President mentioned that he looked forward to coming back to Alaska and being able to bring his family up to enjoy it with him. In parting, the President actually hugged all of us goodbye. Our family was extremely grateful and blessed to share our life with the President of the United States. However, we were more humbled simply to be in the presence of such a good-hearted, strong, and respectable man-Barak Obama. I hope people everywhere continue to look to these men as examples of just how far pursuing your dreams can take you! So… Dream, Try, Win!